Real Madrid were crowned champions of Spain yesterday after defeating Malaga 2-0 on the final day of the season. It is their first league title since 2012 as the country has been dominated by Barcelona in the past decade. 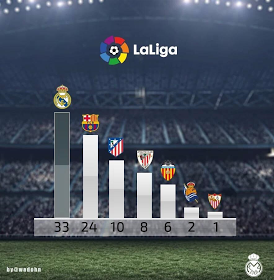 The Catalan side have lifted the league title eight times in ten years but their haul of 24 titles is dwarfed by Real Madrid’s 33.